Apparel and accessory industry has been taken by storm and is witnessing exponential growth as today’s metrosexual professional men like to pamper themselves with the latest trends in apparels and accessories which was earlier considered to be a forte of females. The changing tastes and preferences of males have paved the way for designers and manufacturers to experiment with an array of colour palettes, themes, prints and motifs for men’s wear. The need of the hour is innovation and creation of something trendy yet elegant in the pursuit of fulfilling needs of metrosexual male who like to pop up, mix and match formal and casual look alike. 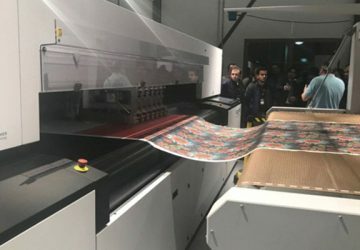 Therefore, shirt making process is being revolutionized as per the target consumer group and still offers huge potential for further refinement. One such concept is the blending of traditional art with the men’s formal shirts, kurtas, and shervaanis by hand block printing, tie and die, batik and hand painting. Hand crafted articles are hot selling products irrespective of gender owing to their inquisitiveness and cultural, rustic association particularly in country like India which is known for rich culture and heritage. 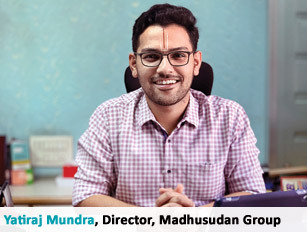 The present paper attempts to redefine the art of shirt making by incorporation of ethnic tinge to men’s shirt via technique of hand painting particularly – the art of Madhubani painting. Madhubani painting is the traditional style developed in the surrounding villages of madhubani in Mithila region, Bihar. 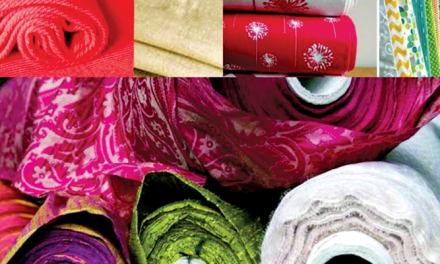 The skill is handed down through generations, & hence the traditional designs & patterns are widely maintained and being used in textiles as well. The beauty of madhubani paintings stay afresh in our spirits however, a lot needs to be done to revive and promote this traditional folk art on national and international platform especially if it can be brought to mainstream by incorporation in designing of men’s apparels. 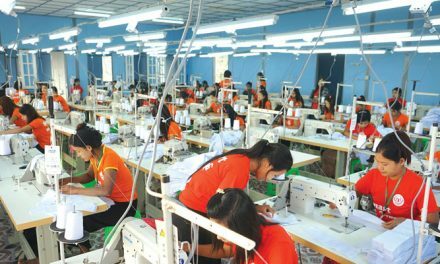 Shirt making is quite labour intensive and technology driven industry where complete shirt making may take several operations before the shirt is in final stage to be packed and shipped. A lot of research and development therefore goes into shirt making process. 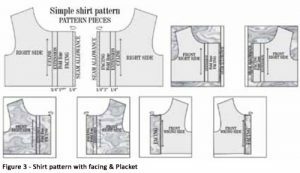 The processes involved in shirt making begins with the conceptualization of design by designers taking inspiration from several sources like flora and fauna, prints based on figurative images, plaid fabrics etc. 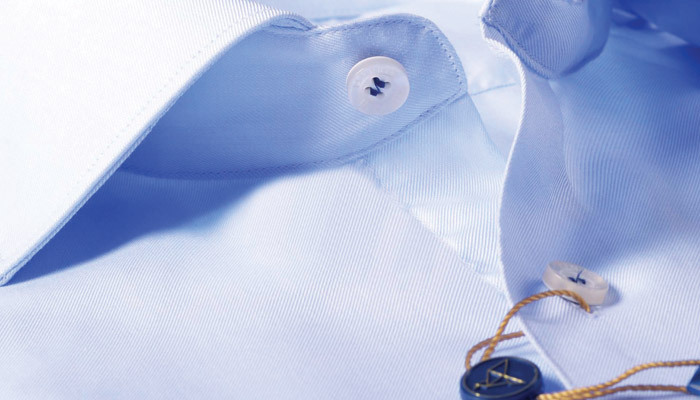 A change in style and design details can render the shirt a casual or formal look. 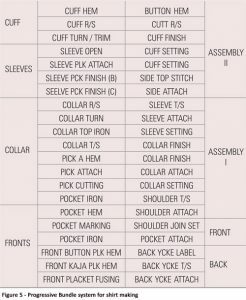 Collar type, neckline, typse and length of sleeve, hem shape and length and variation in type of closures are several elements which designers explore in creating new look in men’s shirts. 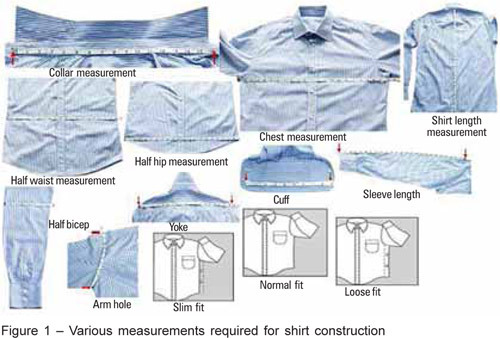 Several measurements like collar, chest, sleeve length, half hip measurement, half waist measurement, half bicep, arm hole, yoke and cuff are required for making shirt’s patterns. 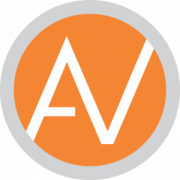 The measurements can be taken from live models for tailored, customized shirts while standardized size charts are used for taking measurements and making patterns in garment production houses. 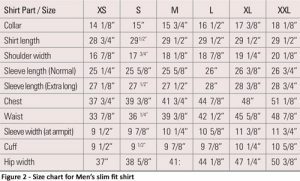 Figure 2 shows the size chart followed for men’s slim fit shirt and Figure 3 shows the placket, facing and pattern for men’s shirt. 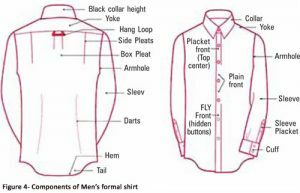 Figure 4 shows the components and design elements of the front and back portion of men’s shirt like darts, side pleats, armhole, collars, sleeves and placket. The first prototype shirt sample made by assembling the cut garment components as per size specifications is sent for approval to client and thereby goes into bulk production. 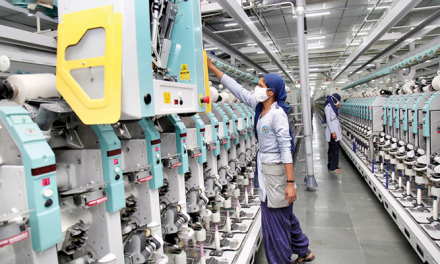 Progressive bundle system is followed in garment manufacturing units for shirt manufacturing so as to ensure all the operations can be meticulously performed fulfilling the quality, quantity and economic parameters as per the deadline set by the clients. In this system, bundles consisting of shirt parts are needed to complete a specific operation. For example, an operation bundle for pocket setting might include shirt fronts and pockets that are to be attached. 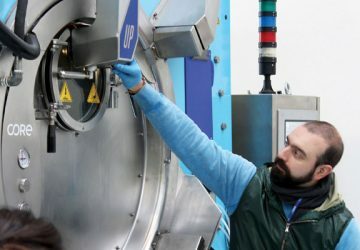 One operator is expected to perform the same operation on all the pieces in the bundle, retie the bundle, process coupon, and set it aside until it is picked up and moved to the next operation. Under this system of assembling shirt, the sewing room would have a number of sections, each containing versatile operators capable of performing the operations required for a specific component. Figure 5 shows the progressive bundle system followed for shirt making. 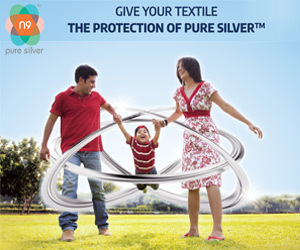 Woven fabrics constituted of cotton, polyester, PET/C, PET/V, linen, silk fibres are preferred choices for men’s shirts with consideration of comfort, drape, fit and aesthetic appeal. Denim, Corduroy fabrics are also preferred for autumn/winter men’s collection. White and pastel shades are colours of choice for men’s summer wear while warm colours like blacks, blues and browns dominate in winter wear shirts for today’s metrosexual males. Plain, even and uneven plaid, camo print fabrics and denims – stone washed etc. 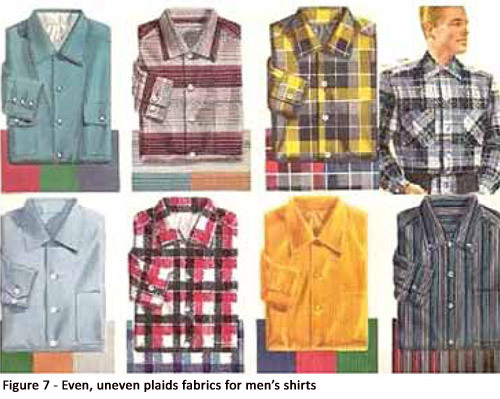 are conventional fabrics extensively being used for men’s shirts (Figures 6 & 7). 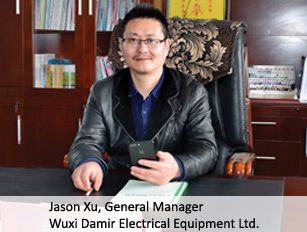 Two hole, four hole sew through buttons, shank buttons, snap fasteners, velcro, interfacing, lining are generally used trims and notions for men’s wear. Inclination of today’s men towards latest trends and no reservations against choosing bright shades with floral, geometrical prints and big motifs has fostered designers and manufacturers to experiment with printed fabrics, tie and die, batik, hand painted fabrics for designing men’s wear particularly for fusion of casual and formal look. Value addition to an ordinary, boring looking shirt can be accomplished by surface ornamentation techniques like unconventional use of trims and notions on neckline, sleeves and hemline, hand painting. The placement of ethnic motifs inspired from Madhubani, warli and kantha art work renders ethnic, traditional look to a formal white shirt. 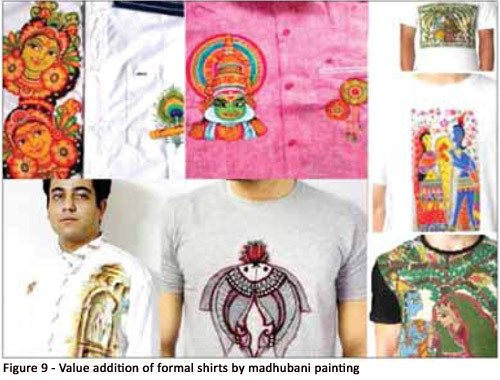 The following section describes the Madhubani technique, motifs used and the implementation of this traditional technique on men’s shirt redefining the art of shirt making and rendering trendy, appealing look. Madhubani painting is a traditional folk art of region of Bihar. It means a “Forest of Honey”. The wall-paintings or mural paintings are popularly known as Mithila painting or Madhubani painting. The tradition of Madhubani painting of Bihar has continued unbroken to the present day and has evolved with the times. The themes for the paintings are taken from native mythology, legends & history. Madhubani painting is an emblematic expression of day-to-day experiences and beliefs. Almost all Madhubani paintings are characterised by the use of bold natural and artificial colours, a double line border with simple geometric designs or with ornate floral patterns on it. The main theme is supported by symbols, lines and patterns. The faces of the figures in these paintings have large bulging eyes and a jolting nose emerging out of the forehead. And lastly, the presence of abstract figures of deities or humans in the paintings. There are images of birds & animals with natural phenomena and human forms including various Gods & Goddesses. The subject matter varies according to the occasion. God –Goddess such as Vishnu-Lakshmi, Shiva Parvathi, Rama-Sita, Krishnaradha etc. as shown in Figure 8. In other forms, the flora, fauna, myth & legend, social customs and expressions giving ritualistic symbols are painted. Colours for Madhubani painting are used according to religious symbolism. Initially all vegetable dyes were used for the painting but today artists have access to a variety of poster colours as per the needs. These paints have a narrow range of colours; generally, Gulabi (Pink), Peela (Yellow), Neela (Blue), Sindhoora (Red) & Suga Pankhi (Parrot Green). Colours used in Madhubani paintings are usually deep red, green, blue, black etc. Besides, deep colour they also apply light yellow, pink & lemon. 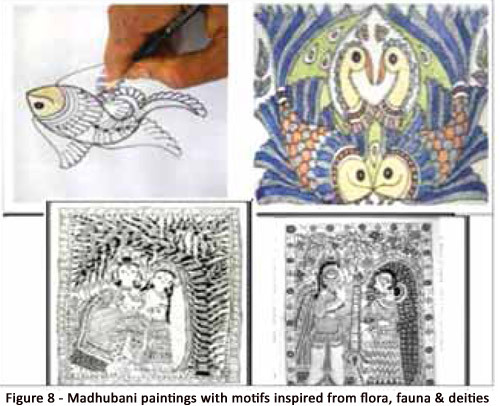 Till date the artisan of Madhubani paintings used colours directly from nature. Lamp soot served as a source of black, white from powdered rice, green was made from the leaves of the apple tree and Tilcoat, blue from the seeds of Sikkot and indigo, yellow was drawn from the parts of singar flower or jasmine flower, bark of peepal was boiled to make a part of saffron colour, red was made from kusum flower and red sandal wood. The brightness and longevity of paintings was ensured by addition of gum with colour. However, the use of synthetic colour and modern round brushes are replacing the cotton tipped bamboo sticks and stiff twigs that used to serve as brushes still a few years back. Artists skilled in this art make a rough sketch first and then the detailed drawing of subject matter is completed with bold straight and curve lines. Finally, the drawing is filled with different colours whenever it is required. The colours in the paintings are applied flat and the figures are rendered with double outlines with the space in between filled with thin crosshatchings or slanting lines. 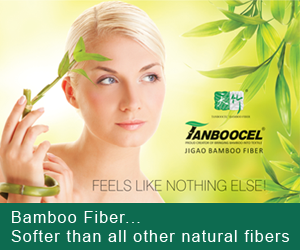 The traditional art form is enjoying popularity in women ethnic and fusion wear. 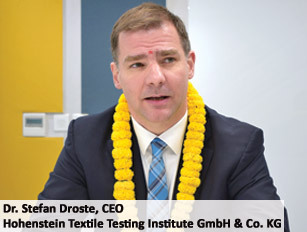 Likewise, the inquisitive and beautiful technique is being employed to embellish men’s attires as well. Figure 9 shows the strategic placement of bright, colorful madhubani motifs on pockets, bodice of shirts and T-shirts reaffirming the elegance of men’s apparel. 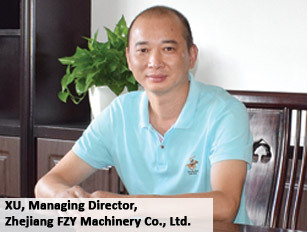 The effect can be created by one of the innovative printing method i.e. digital printing however the uniqueness and brightness of colours is more fascinating following the conventional hand art technique. The art form has potential of expansion in different categories of clothing irrespective of age and gender of consumers thus redefining and converting the otherwise simple looking apparel into a masterpiece of traditional ethnic brilliance. 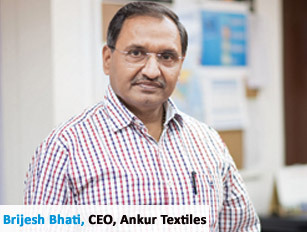 Shirt making process is an art demanding skill at the hands of designers, manufacturers and operators involved at each of the manufacturing steps. 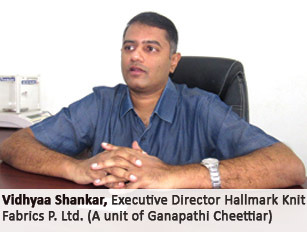 The industry is undoubtedly technology driven and is a promising profit making venture for garment units. 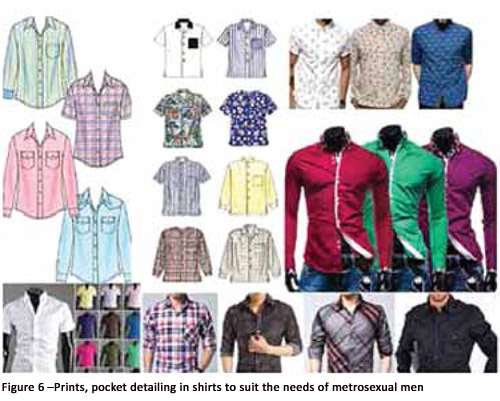 Change in preferences, tastes and liking of today’s fashion conscious metro sexual males has paved the way for experimentation in selection of fabrics, sundries, value addition and embellishment techniques for shirts. It is thus possible to modify the look of shirt by hand painting techniques like use of madhubani motifs either throughout the bodice or along pocket, placket, cuff and yoke of men’s shirt thereby rendering a trendy yet elegant appeal. Madhubani paintings are a blend of aesthetic appeal, rich Indian traditions and heritage. A whole new surge of reviving the traditional Indian craft forms, modern and experimental touch to the art forms has prompted the implementation of these art forms to men’s apparel so that fashion conscious, metro sexual yet heritage loving males can connect to their roots and stay trendy at the same time. 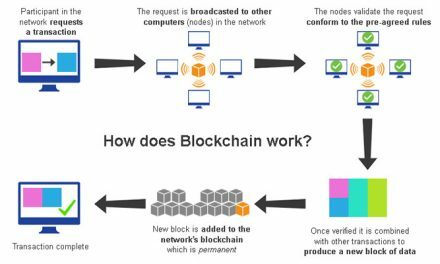 NextIs “made in Africa” the next big thing?